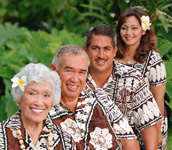 Named “best luau on the island” by the popular Kauai Revealed guidebook. Come experience the rhythm of aloha and the taste of Hawaii! The original gentle adventure to the heart of Kauai. Experience the songs and legends of the historic Wailua River Valley and the Fern Grotto. Spend a quiet afternoon at this lush 30-acre botanical and cultural garden in the heart of the historic Wailua River Valley. Kauai is known the world over as a romantic island. Now you can tie the knot (or renew your vows) in our little corner of paradise. Over 60 years ago, Walter Smith, Sr. and his wife Emily started this company on the Wailua River with a small rowboat and a borrowed outboard motor. Today, four generations later, the Smith family continues to welcome kama‘aina and malihini alike to experience the natural beauty and cultural heritage of Kauai and the Wailua River Valley. Before you arrive on Kauai, make sure to explore the Wailua Heritage Trail web site. And, once you’re here, stop by our Visitor Center at the intersection of Hwy. 56 and Hwy 580 (Kuamoo Road) and ask for the free Wailua River Valley brochure and map. Historic details, points of interest, and a large color map will help you get the most out of your time on Kauai’s ‘Coconut Coast.’ We can also book reservations for any of our activities, or assist with other activities like kayaking, helicopter tours, and more!